So if you know me, or read this blog, you probably know that turtles are pretty much up there at the top of my list as far as animals go. I've been a turtle nut for as long as I can possibly remember, and I've peppered turtle posts throughout the years at this blog. I just can't help myself, I suppose, I'm a sucker for a nice turtle. This past Sunday afternoon I photographed this common map turtle. Or I thought it was a common map turtle. 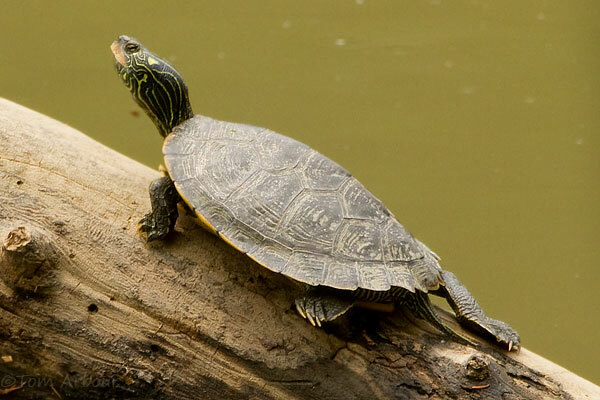 I even named my photo for this post "common_map_turtle_olentangy". I always do a little cursory research before I post something, and my search for common map turtle turned up a wiki article for "Northern Map Turtle". Northern Map Turtle? What the heck is that? Well- it turns out that there is a committee that produces a list of standard common and scientific names for North American Herps north of Mexico. In their latest publication the committee changed the name from "common map turtle" to "northern map turtle". Why? They give this reasoning- "We have changed the name from Common Map Turtle because of the possibility that the word “common” might be misinterpreted to imply abundance rather than to the fact that it has a broad range." There you go- broad range, not necessarily common. Therefore, we have the Northern Map Turtle. That name is going to take me some time to get used to. I previously typed a long (better) response but lost it somehow. Basically, take that list as a grain of salt. There are two bodies that argue over a "common names" list. One is CNAH run by Joe Collins, who also now is the author of the Peterson Guide, and the other is SSAR. Joe used to be in SSAR but left and started his own organization due to disagreements. The list you link is out of date ('00), the newest version is the 6th (08) and there is a completely current version that is constantly updated online. The CNAH list still has "common map turtle", the SSAR one has "northern map turtle". I find myself becoming an old fart and sticking to older names. I have yet to start using Lithobates, Anaxyrus and I sure am not calling them "northern map turtles". What gets really interesting is when Collins publishes the new Peterson Guide with "common" but the Ohio guys publish the Ohio reptile guide with "northern". What do you use then? I will be herping southern OH again this Fri and am pumped. MI has some awesome turtle diversity, but I miss box turtles badly. I keep looking for a turtle. Any turtle will do. I hope to see one turtle along Twin Creek but so far have not seen anything that looks like a turtle. Sometimes, my memory tells me they lay on logs sticking out of the water to enjoy the sun, but I never see them either. I like the turtle you shot and that's about as far as I would go in calling it a specific kind of turtle. I have only heard of a "box" turtle in my life. I am not even sure where I heard that name. BH- Good points. Does Michigan have anything turtle-wise that Ohio doesn't? Enjoy! Abe- Yes- your best bet is to look for logs in the pool of the river- a large area with deep slow moving water. During the summer, turtles bask on those types of logs starting in the morning when the sun hits the log- They warm up, and when they're warm, they'll enter the water and start looking for food. Box turtles are definitely around, especially in southern and southeastern Ohio- I posted a picture of one that I encountered a few weeks ago. Ohio has Michigan beat pretty much across the board, even with turtle diversity. That being said, MI has my personal favorite, the wood turtle (Glyptemys insculpta). I spend most of each summer paddling rivers in northern MI for these beasties. In fact, I already found 4 back in early May on a couple different trips despite the cool temps and even colder water. Ohio has a record or two of wood turtles that were found just east of Youngstown, which might possibly have wandered over from Penn, but at this time they are not officially recognized to my knowledge. Other than that the buckeye state continues to take the cake. MI lacks smooth softies and ouachita maps. If you happen to find a box turtle, it is a pretty big deal. I should spend time looking for the ouachita maps, but I miss flipping tin and hiking timbers too much.